FOR CAKE: Preheat oven to 350 degrees F. Butter and flour two 9-inch-diameter cake pans with 2-inch-high sides; line bottoms with rounds of parchment. Sift flour, baking powder and salt into bowl; set aside. Using electric mixer, beat butter in large bowl until creamy. Gradually add sugar, beating until blended, scraping down sides of bowl once or twice. Continue to beat until light and fluffy; beat in vanilla. On low speed add flour in 2 or 3 batches alternately with coconut milk. Beat just until blended. In clean bowl, whip egg whites just until soft peaks form. Gently fold one-quarter of the whites into the batter to lighten, then fold in remaining whites. Transfer to pans, spreading batter evenly into pans. Bake cakes until tester inserted into center comes out clean, about 25 minutes. Cool cakes in pans for 5 minutes, then unmold, peel off parchment, and cool completely on racks. (Can be prepared 1 day before assembling. Double wrap with plastic wrap and store at room temperature.) WHILE THE OVEN IS ON, YOU COULD TOAST THE COCONUT – SEE BELOW. IT IS LISTED AS PART OF THE FROSTING LIST (because it is part if the frosting assembly). FOR FILLING: Combine peaches, sugar and lemon juice in non-reactive saucepan; mash with potato masher to reduce to a thick pulp. Bring to a boil over medium-high heat, stirring frequently, until thickened, darkened and reduced, about 25 minutes. You should be able to see the bottom of the pan when you draw a spoon across. Let cool to room temperature. (May be made one day before assembly. Pack into airtight container and refrigerate). FOR FROSTING: Preheat oven to 350 degrees. Spread coconut out onto a rimmed baking sheet into a single layer and bake for about 6 minutes. Stir it around and bake for another 6 minutes or until lightly toasted and some shreds are golden brown. Let cool to room temperature. The day before serving, whip cream, coconut milk and sugar together until stiff peaks form. Split each cake in half horizontally. Place one cake layer, cut side up, on platter. Spread with peach filling. Top with second cake layer, cut side up and spread with more peach filling. Repeat with third layer and more filling ending with last cake layer placed cut side down on top. Spread whipped cream frosting thickly over top and sides of cake. 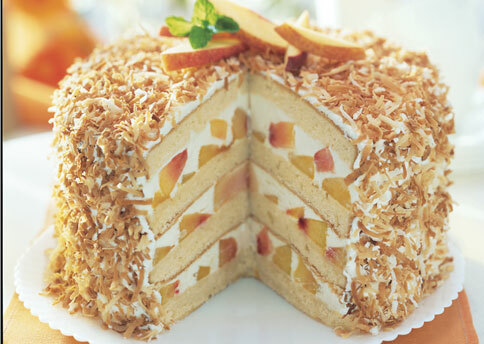 Cover cake completely with toasted coconut. Cover with cake dome; refrigerate overnight. Let stand at room temperature 2 hours before serving. Immediately before serving, thinly slice the peach and make a circular fan on the center top of the cake.